Trinity is eagerly awaiting the arrival of our sponsored Burmese family currently living in Ban Mai Nai Soi Refugee Camp in Thailand. Preparations to welcome them continue and most of the household items needed have been collected. 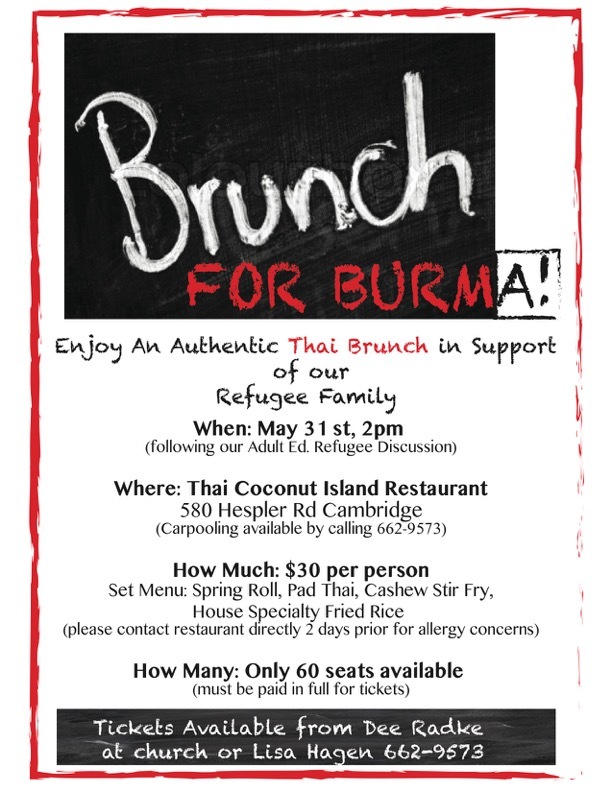 A fundraiser brunch will be held in their honour at the Thai Coconut Island Restaurant in Cambridge on May 31, 2015 at 2p.m. Tickets are $30 and only a few remain for this delicious meal and this wonderful opportunity to support a young family seeking refuge in our midst. Call (519) 662-9573 to reserve your seat! This entry was posted in Food, Refugee Resettlement on May 21, 2015 by trinitynewhamburg.